As we approach the holiday season, many minds are focused on lists. Holiday shopping wish lists, holiday card lists, to do lists, the list goes on! At AlphaGraphics we are always thinking about lists throughout the year. Here’s why you should be too. Let’s use the example of sending out a mailing. When setting up an excel file of data for a mailing, be sure to have a separate column for each data field for each separate contact. There should be no more than 2 columns for the address (address 1 and address 2). These should be numeric street addresses. If you would like to include a business or organization in the excel file, they should be separate columns from the address fields. There should not be any hard returns in any cells of data in the excel file. Try to make sure the data in the excel file is the most current data you have. Are the addresses complete? Do you have zip codes? The more information we receive in the file, the better chance the addresses have making it through our mailing software successfully. Check out the sample screen shot of an excel file for mailing for a visual on what the initial set up looks like. As always, the team at AlphaGraphics is available to answer any questions you might have when gathering data for a mailing. As an added bonus for reading the blog: check out this fun little type kerning game……test your skills! Happy list making and happy holidays! Such were the Facebook postings we were receiving as our coconut mailing gained steam. With the buzz building, it was time to launch the second phase of our “Use Your Coconut” campaign, about two weeks after the coconuts were mailed. Our strategy was to continue to explore attention-grabbing direct mail formats, so we chose to mail an oversized, “lumpy and bumpy” envelope that contained a personalized, vellum insert sheet, a 4-page brochure, and a tent card “freemium.” The envelope itself was intriguing: made of brown translucent paper, it stood out in the mail pile. 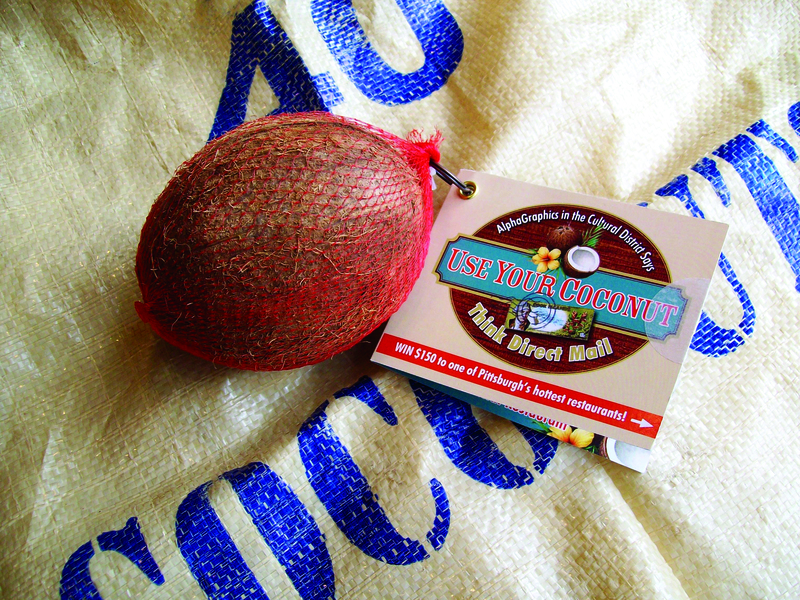 Furthermore, the contents were designed so that a large “Use Your Coconut” logo showed through the front of the envelope like a colored watermark beneath the address. A colorful butterfly first-class stamp added to the tropical vibe. Each recipient opened the envelope to see a personalized vellum insert sheet with either a “thank you” message and reference to their response to our survey, or a “there’s still time” message and “second chance” offer to enter to win a secondary prize­—a $50 gift certificate to a local tropical-themed restaurant—if the recipient logged on to his or her personalized URL. Under the insert was a 4-page brochure—another customer education piece—with the Top 4 Trends in Direct Mail, personalized to each recipient. A third enclosure—a tent card “freemium” containing either a recipe for a pina colada, coconut cream pie, or coconut shrimp; an instruction card for creating a coconut shell planter; or an instruction card for playing Coconut Bowling—rounded out the package, and was matched to each recipient’s answer to a survey question on how he or she would like to use his or her coconut. Our multi-channel, multi-touch campaign had really taken off! As the result of the first and second phases of the campaign, we achieved a 46% response rate, more than doubling our goal of 20%! To keep things interesting, we continually posted coconut photos, updates, and musings on our Facebook page while our customers chimed in, and tweeted about our campaign. We also posted fresh rotating website banners every 4-5 days proclaiming various direct marketing factoids. To cap the second phase of the campaign, respondents received a “Save the Date” email, inviting them to pencil in on their calendars a special lunchtime marketing event hosted by AlphaGraphics. 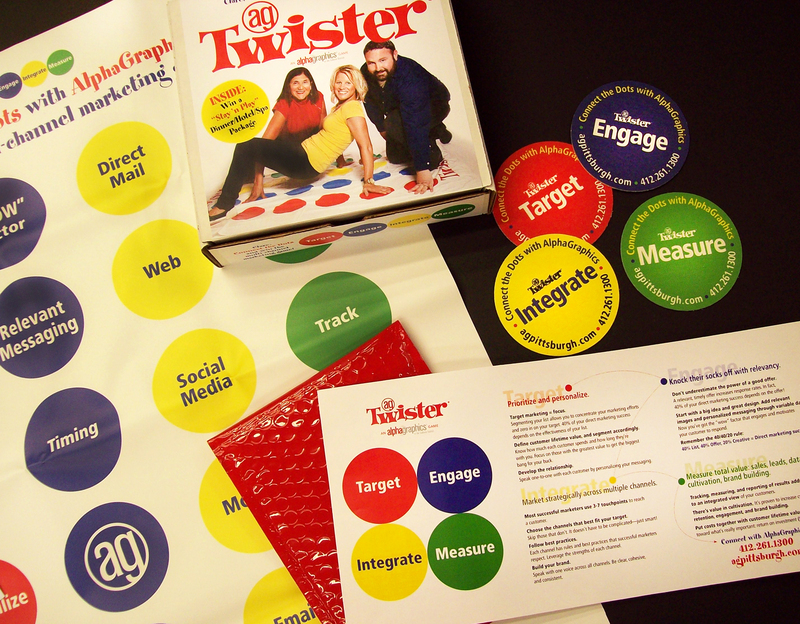 The culmination of the campaign, this executive marketing workshop promised to be a truly dynamic, interactive demonstration of the power of integrated direct mail using a multi-channel approach. It’s been quite a ride watching the campaign grow from a simple objective—positioning AlphaGraphics in the Cultural District as thought leaders in direct marketing and building awareness of our mailing services—to through-the-roof response rates and a visit from one of the country’s leading experts in multi-channel marketing. In this post, I’ll explain our rationale for the theme and the first phase of the campaign; future posts will address phases two and three, and a wrap-up of results. On day one, we articulated our objective and set our sights on the bullseye: who we are aiming to reach. Our target audience was composed of high value current customers not using our mailing services but likely to, or using our mailing services, but on a limited basis; and a few key prospects. Because our focus was mailing services, we wanted to demonstrate the use of a number of mailing formats and multiple touches. Since a high-profile direct marketing event was to be the culmination of our campaign, we determined we needed to mail an invitation, preceded by at least two other major touches that would effectively engage and motivate our audience. With an audience that can sometimes be hard to reach (higher level executives often get their mail screened, a.k.a. rerouted to the round file) but well worth it if you do, we decided on a dimensional mailer to break the ice—more expensive than other formats, but capable of delivering a higher return on investment. Here’s where the creativity really kicked in! We took “thinking outside the box” to a whole new level when I asked, “Did you know you can mail a coconut?” Having heard that it was possible (but not knowing how one does it), we concocted the campaign theme, Use Your Coconut, which invited our target audience to use their coconuts both literally (the furry brown fruit that grows on tropical trees) and figuratively (as in, using your brain for thinking and learning). Considerable research, trial, and testing was necessary in order to determine how best to mail a coconut! After ruling out painting on it (messy and time-consuming), adhering a label on it (smooth surface needed for sticking power! ), and shrink-wrapping it (mold grows after four or five days), we hit upon wrapping it in nylon netting and attaching a hangtag. Our design team partnered with several U.S. Post Office officials in preparing a final sample that was not only mailable, but eye-catching and impossible to ignore in one’s mailbox. 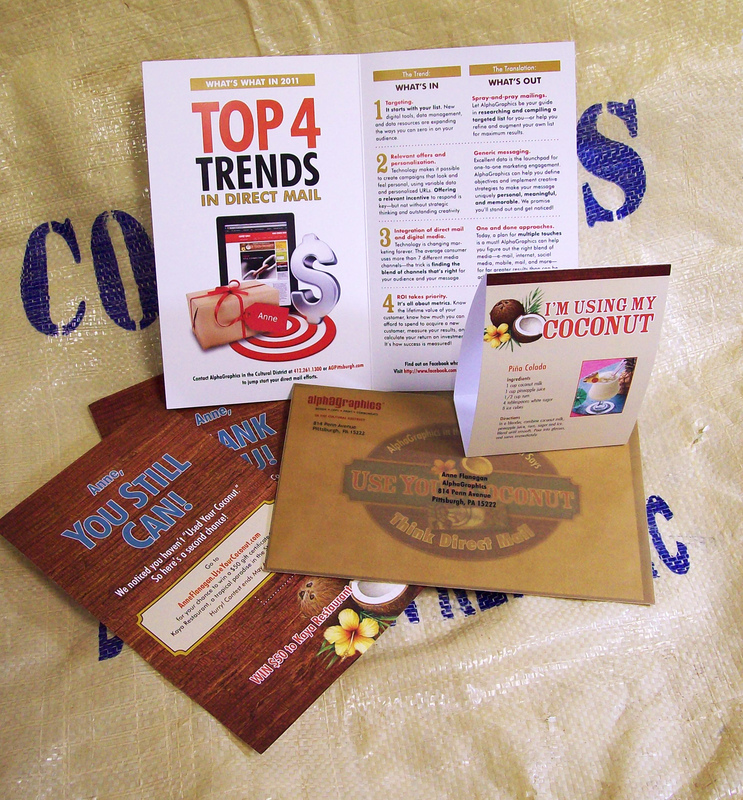 Branded with a uniquely designed Use Your Coconut—Think Direct Mail logo, our coconut mailer certainly grabbed attention. The hangtag featured a few educational factoids on direct mail, and invited recipients to go to their personalized URL for a chance to win a $150 gift certificate to one of Pittsburgh’s hottest restaurants. Respondents answered survey questions that gave us valuable information on their businesses’ mailing needs, as well as on their favorite uses for their coconuts. We basically went nuts for coconuts, creating large window clings for our center’s windows (one featured a quiz and text message answer), rotating website banners proclaiming various mailing factoids, and a Facebook page featuring coconut photos and entries posted by our staff members and clients alike. Surrounded by coconuts (purchased in the Strip District in 40 lb. bags), our staff needed a break after the mailing. Our manager, Rich, grabbed a hammer and whacked away at one of the extras. Cracking the thick-walled orb was difficult, but once it split, a big puddle of coconut water spilled out. Quickly catching the remaining liquid in Dixie Cups, we drank. Most of us hadn’t dealt with a “real” coconut before. “Tastes like bathwater, with a coconut aftertaste,” I said. The coconut meat wasn’t much better. The sweetness I’m accustomed to apparently comes later, in the processing and packaging of the flaky coconut I purchase in plastic bags. Tastiness notwithstanding, our coconuts impressed­—in fact, they set records. 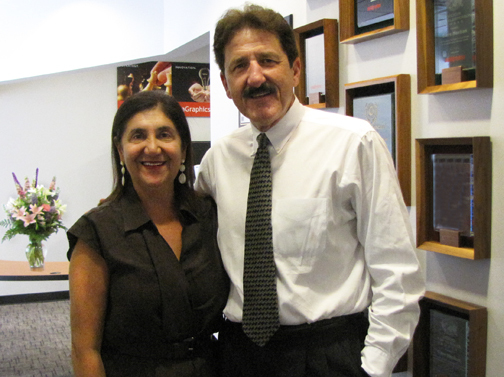 Stay tuned for more details….